The European Parliamentary Research Service (EPRS) provides comprehensive research and analytical support to the Members of the European Parliament, its parliamentary committees and the European Parliament as a whole. The EPRS philosophy is to provide independent, objective and authoritative information. We aim to provide a comprehensive research and analysis capacity of the kind to be found in many parliamentary democracies worldwide. We always try to adapt our products to best meet the needs of the Members of the European Parliament. What suits their needs today, may be of low value for them tomorrow. Nevertheless, on this website you will come across certain standard products that have proved particularly valuable throughout the years. Each of them has a corresponding tag and treats a topic in a unique way. If you are interested in receiving our monthly newsletter to the think tank and research community, which gathers links to a selection of our best publications from a given month, please send us an email to EPRS-StrategyCoordination(at)europarl.europa.eu. The central task of the Members’ Research Service is to ensure that all Members of the European Parliament are provided with analysis of, and research on, policy issues relating to the European Union, in order to assist them in their parliamentary work. 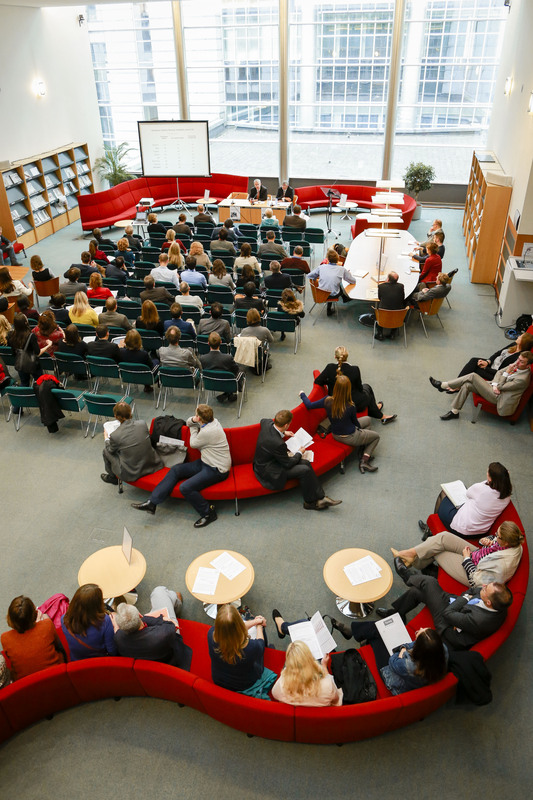 The Library provides on-site and online services, access to internal and external publications on European and national issues, and online access to news and information services. It also offers certain public services, in the form of the Historical Archives of the European Parliament and the ‘Ask EP’ Service. These services contribute to identifying the need for action at European level and provide scrutiny and oversight of EU legislation in practice. This Directorate is supported by research and analytical capacities in all areas of policy, drawing if necessary on outside expertise. It covers the following activities: Ex-Ante Impact Assessment, European Added Value, Ex-Post Impact Assessment, Policy Performance Appraisal, European Council Oversight, Global Trends and Scientific Foresight (STOA) unit. See a more detailed description of the service on the EP website. A more detailed presentation of the EPRS. A portal with all publications produced by any of the research departments of the European Parliament. All the services related to the EU citizens in one place. The Policy Department of the Directorate General for External Policies, which provides the European Parliament’s official bodies with specialist information, analysis and advice. They prepare policy advice, briefing notes, speaking points and oral briefings for the President, as well as information notes and analytical documents at the specific request of Committees or Delegations. Where necessary, the Policy Department commissions studies by external experts. They also publish all European Parliament Fact-Sheets on External Relations, and participate in the preparation of delegations and meetings. The Deputy Secretary General (DSG), who is responsible for legislative coordination and planning both within the Parliament and in relation to other Institutions, particularly the Council and the Commission. In carrying out these tasks, the DSG is assisted by the Inter-institutional Relations Unit and the Legislative Planning and Coordination Unit (and is also responsible for the Classified Information Unit). The DSG’s services assist the President and the Parliament’s governing bodies with briefing and background notes on specific dossiers and procedures, prepares the preliminary draft agendas of plenary sessions, as well as other documents in relation to strategic programming, such as on activities of the Commission and the Council. The Transparency Unit is the single entry point for all public requests for Parliament’s documents. The unit monitors the recording of the documents in the Public Register of Parliament’s documents , receives and processes the applications for not directly available documents on the Parliament’s website, and coordinates the replies with the Parliament’s responsible services, acting under the authority of the Secretary General and the supervision of the Vice-President responsible. GlobalStat, a project of the EUI’s Robert Schuman Centre for Advanced Studies and the Francisco Manuel dos Santos Foundation aims to offer the best available gateway to statistical data. It is easily accessible, intuitive to use, and free of charge. In just three clicks it offers data from 1960 onwards for 193 UN countries, five continents and 12 political and regional entities – including the European Union – gathered from over 80 international sources. The project, presents data as diverse as income distribution, water resources, housing, migration, land use, food production, nutrition, or life expectancy, which contributes to a better understanding of the interrelations between human living conditions and globalisation trends. Do you want to know about the work and functions of the European Parliament? Send us a question! Use our ‘Ask EP’ form. The present website is hosted by WordPress.com, a service by Automattic. Automattic is a global company with thousands of servers located in several separate data centres around the world. While Automattic takes care of the security of the platform, we, the European Parliamentary Research Service, own the content of the blog. For more detailed information about the compliance of Automattic products and services with the EU General Data Protection Regulation (GDPR), please see their dedicated page. We do not collect any personal data that could identify an individual user. The users that are registered in WordPress.com should consult wordpress.com terms of service. We do collect anonymised aggregate data for statistical purposes. The data collected for this purposes include: number of visits/visitors per page, the country of the user, and aggregate numbers of incoming and outgoing clicks. We determine unique page counts by using a “hashed” version of the visitor’s IP address. The visitor’s full IP address is deleted from our logs after a little over a month. That timeframe is how long the data is needed in order to allow us to calculate your stats on a monthly basis and no longer. We collect your email address only if you proactively requested to be notified about the updates on the blog. You can always contact us to remove your email address from our records or unsubscribe from the notification service. We can also see your name and email address if you made a comment to one of our posts. We do not make the email address visible on the comment. Nevertheless, on request, we can delete your comments. We collect cookies only to facilitate your browsing experience, such as enabling you to share our posts via social media or comment on the post. The majority of cookies will be used only if you are a registered WordPress.com user. In this case, you are bound to WordPress.com terms of service. For any further information or for cases where you want to unsubscribe from any of the services mentioned in these terms and condition; delete all or part of your data; or request access to the personal data we save about you, please contact the person designated as being in charge of the processing operation via EPRS-StrategyCoordination@europarl.europa.eu . You have the right to have recourse at any time by writing to the Parliament’s data protection officer at data-protection@ep.europa.eu and to the European data protection supervisor at edps@edps.europa.eu. Please note, however, that we cannot help with questions related to your wordpress.com account. For this questions, please refer to wordpress.com terms of service. In case of repetitive breach of these guidelines, we reserve the right to block a person from participating in discussion on this site. Comments posted on our website do not necessarily represent the interests or opinions of the European Parliamentary Research Service and the European Parliament. The Europe cultural mobility funding guides for the mobility of artists and cultural professionals are not funded by the European Commission but coproduced by the cultural mobility information network, On the Move. Many thanks for this clarification! We will adapt the text and publish it in a few days. Thanks a lot. When amended, we will share this on our social networks. Could you please specify where exactly have you found these two links? I check this page on a regular basis http://www.europarl.europa.eu/thinktank/en/home.html. I noted the link related to Alcide De Gasperi on the 16 May and the European Council: Facts and Figures link last week. Thank you! We will try to correct this as soon as possible. I’m Lohan BERRIAU, a french student in International Trade. As part of my studies, i have to do a research and a presentation about the ENGLISH organic vegetables sector. I was wondering if you could share with me some information about this topic. – And every usefull information about this topic. Just a note for you to know. In this factsheet http://www.europarl.europa.eu/atyourservice/en/displayFtu.html?ftuId=FTU_5.3.8.html please update this reference “joint, cross-cutting calls under the Seventh Framework Programme for Research for an integrated approach to maritime affairs,” to Horizon 2020 Programme. Although it should be the reference in the legal text, in 2014-2020, you no longer have the Seventh Framework Programme. Thanks a lot for your remark! We have informed the relevant service and we will issue an update as soon as possible! perhaps the assets of the library are not shared in the best way. how would one access more information?